Passed away peacefully on January 6, 2018 at home with her husband, Merl at her side. 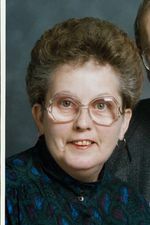 She will be missed by her brother Neil Bignall (Judy), her sister Karen Taylor (Paul) and her brother Frank Bignall (Marie), and sisters-in-law Marie Bauman and Betty Bauman. Her smile and laughter will be missed by many nieces and nephews. She was predeceased by her parents Frank and Meta Bignall, parents-in-law Noah and Hilda Ziegler, brothers -in-law Laverne Ziegler, Abner Bauman and Elmer Bauman. Friends and family will be received at the Ward Funeral Home “Brampton Chapel” , 52 Main Street S, Brampton on Tuesday January 9, 2018 from 6-9p.m. A Funeral Service will take place on Wednesday January 10, 2018 at 11:00 a.m. in the Chapel . Interment to follow at Glendale Memorial Gardens. As expressions of sympathy, donations to the Canadian Cancer Society would be appreciated by the family.